I love lentil soup and I almost always have some dried lentils sitting around waiting to be turned into a delicious soup. It’s interesting that I would even think of this, since I have never had Moroccan food in my life. Where do these little seedlings of ideas that sprout in my head come from? 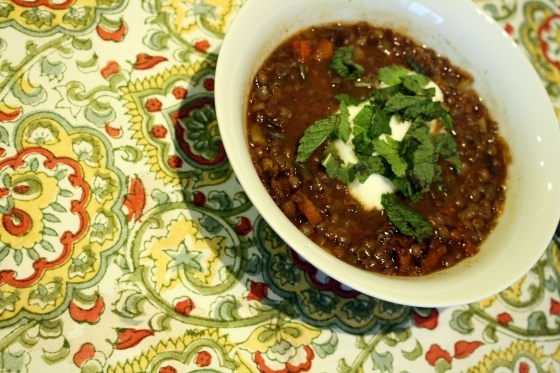 After researching what spices are typically used in Moroccan food, I was well on my way to a new soup creation. 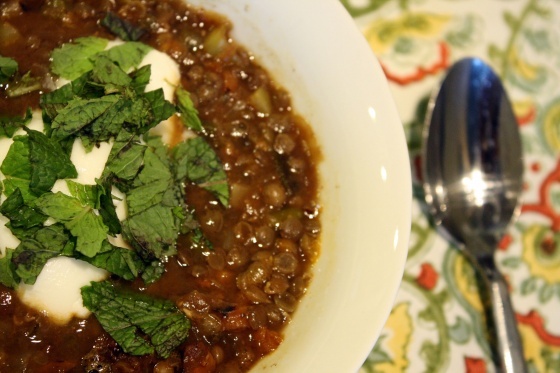 Cover lentils with water in a large pot and simmer for at least an hour or until they are soft. Drain lentils and put them back in the pot. Heat oil on a medium high temperature in a pan and add the carrots, celery, onion, and garlic scapes. Cook until softened. Add to the pot of lentils with vegetable stock. Add all spices and allow to cook for about 15 – 20 additional minutes. Spoon into bowls and top with plain yogurt and chopped fresh mint. *Substitute 2 cloves of minced garlic if you do not have garlic scapes. Now, whether this soup is authentic or not, remains to be seen. Who knows if garlic scapes grow in Morocco? 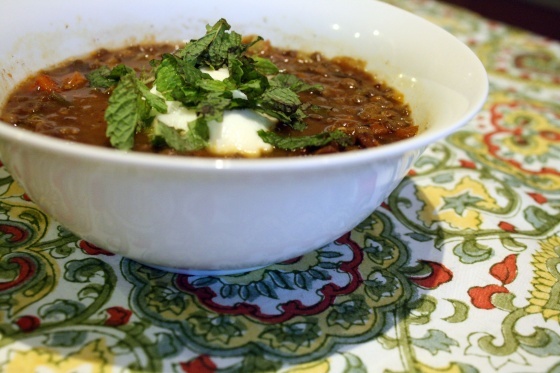 Lentil soup is so hearty and delicious and I found this combination of spices to be very new and interesting in the soup. These spices are used often in my kitchen, but have never been combined in this particular way. The soup was delicious and it was fun to try something so outside of my repertoire. What new recipe or food have you tried lately? Have you tried Moroccan food and did you like it? Do you stick to the same standby recipes or do you like to branch and try things that are completely new? If you’ve missed out on some of my peachy creations over the past month, check out my latest SavorNC blog post!